Faculty: Medicine and Health Sciences. The 8th scientific conference of the Sudanese association of pathologists. Khartoum 1999. Current trends in plastination. Faculty of medicine , University of Malaya, Kuala lumpur,Malaysia.2004. Rrecent advances in surgical pathology , king faisal specialist hospital and research center Riyadh, KSA. 2005. 5tharab conference on blood transfusion. Faculty of medicine, University of sharija, UAE,2005. WHO fellowship course on hospital management. Wandsworth, London, UK, 2006. 7th international scientific conference of the international academy of pathology, Kuala lumpur Malaysia , 2007. Diagnostic cytology course , ain shans University, Cairo , Egypt,2009. 11thScientific conference of the Sudanese association of pathologists , Khartoum, 2009. Soft tissue pathology workshop, A course organized by the British-Arab School of pathology, Khartoum, 2010. Instructional methods in medical education, a course organized by the educational development centre, Faculty of Medicine, University of Khartoum, 1998. Scientific research methodology : a course organized by WHO and federal ministry of health, Kordofan University , 1999. Assessment and evaluation of medical students : a course organized by the educational development center , faculty of medicine, Khartoum University, 2004. Curriculum planning : a preconference workshop , 1st international conference on medical education soba University hospital, 2005. Problem –based learning : a preconference workshop , 1st international conference on medical education , soba University hospital, 2005. 1st international conference on medical education, soba University hospital, 2005. A preconference workshop , 1st international conference on medical education , Soba University hospital, 2005 . E-learning : a preconference workshop, 2nd international conference on medical education , soba University hospital, 2007. Evidence – based medicine : a preconference workshop, 2nd international conference on medical education, Soba University Hospital , 2007. 2nd international conference on medical education , soba University hospital , 2007. Strategic planning for the faculty of medicine and health sciences : a workshop under the supervision of Jazan University at Kordofan University , 2010. E-learning : a course organized by FRUFORUM at Kordofan University , 2011. Committee for the executive and financial affairs of the University Senate. Committee for students study fees. Head council of the faculty of medicine and health science. Member, Council of Graduate Deanship. Member, Faculty of Medicine and Health Sciences Research Council. Member, Council of Students ' Deanship. Member, all Faculties ' Councils . Member, higher council of Sudanese medical specialization board . Member, Sudan medical council EL-Obeid Branch. Designed " Forensic Medicine and Toxicology " curriculum, the one now taught in the Faculty. Designed the curriculum of " Medical laboratory Science " which is now taught in the Faculty. Developed the current " pathology " curriculum of the Faculty. Participated in renewal of the curriculum of the Faculty. 44 BSc (honor) researches ( medical laboratory sciences students). 54 MBBS researches (medical students). 8 MSC students as follows. President of the trade union of workers of Kordofan University to date. President of the trade union of the workers of the Faculty of Medicine and Health Sciences 2005 – 2011. President of doctors union , north Kordofan state- to date. Member of the executive office of the federal professional union of universities and higher institute teachers to date. Member of the council of the federal doctors union – to date. Member of the council for health service coordination , north Kordofan state –to date. Member of the administrative board of EL-Obeid Advanced Diagnostic Center –to date. Member of the administrative board of EL-Obeid Teaching hospital – to date. Consultant pathologist offering diagnostic services to the public in EL-Obeid Teaching hospital and regional health laboratory since 1997 to date. Director regional health laboratory : 1998 – 2009. 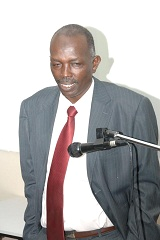 Director, laboratory directorate , ministry of health, north Kordofan state - 1997 – 2009. Director of planning ministry of health , north Kordofan state – 2000 – 2005 . Director, health research unit , ministry of health , North Kordofan State: 1999 – 2005. Director General , EL-Obeid Teaching Hospital 2006 – 2008 . Ireimenam NC, Khirelsied AH, Agab Aldour AA et al. Antibody responses to penel Plasmoduim falciparum malaria blood-stage antigens in elation to clinical disease outcome in Sudan. Vaccine 2009 Jan 1; 27(1): 62-71. Mohammed HI, Agab Eldour AA, Khalid KT, Ali KT. Clinical and haematological findings in Sudanese patients with sickle cell disease attending the hospitals in Elobied, Kordofan. Gezira Journal of Healh Sciences June 2006, vol 2(1): 40-50. El Tayeb MM, Daoud OH, Agab Eldour AA, Khalid KT, Ali KT. Biochemical and clinical assessment of thyroid status in patients with thyroid disorders referred to Elobied regional health laboratory. Gezira Journal of Healh Sciences June 2008 vol 4(1). Elfaki AM, Agab Eldour AA, Elsheihk NM. Sero-prevelance of immunodeficiency virus, hepatitis B and C and syphilis among blood donors at Elobied teaching hospital, west Sudan, Sudan JMS vol 3, No 4 Dec-2008: 333-337. Hassan MA, Agab Eldour AA, et al. Association of hyperthyroidism and Blood Glucose Level in Patients Attending Elobied Hospital in Western Sudan. Gezira Journal oh Health Sciences Vol 5(1) June 2009, 72 – 77. Agab Eldour AA, Ahmed et al. Utility of CD3 and CD30 in Immunophenotyping of Lymphomas Among Sudanese Patients. J Cancer Sci Ther 2011, 3:5. Agab Eldour AA, Mohmed MG. Haeamtological and Chemical Changes in Children with Acute Severe Malaria presenting with Diarrhoea. 17th Scientific congress of SAP, 2011. Ahmed ME, Hamid HB,Babikir HE and Agab Eldour AA. Effect of Grewa tenax (Guddaim) as a natural food on haemoglobin level and growth among displaced children of Darfur State, Western Sudan. Journal of Medicine and Medical Sciences Vol. 3(11) pp. 729 -733. Nov 2012. Agab Eldour AA, Salih IN,Ahmed HG. Incidence of Tuberculosis and Amyloidosis Among Sudanese Patients presented with Enlarged Nodes. Hindawi Publishing cooperation. Journal of Tropical Medicine. Volume 2014. Articcle ID 852029, 4 pages. Agab Eldour AA,Ismail ME, Khalafalla TO,Younis MS, Babikir AM. Red cell alloimmunization in blood transfusion dependent patients with sickle cell Disease in El-Obied city, Sudan. Journal of Dental and Medical Sciences, vol.14, Issue 12 Ver, Dec 2015, pp 137-141. Mohammedzien MA, Agab Eldour AA, Elamin EA. Prevalence of Urinary Schistosomiasis in Alrahma Area. International Journal of Experimental Pharmacology. Vol5, Issue 2, 2015, pp. 78-81. Agab Eldour AA, Khalafalla TO, Abdalla AM. Haematological changes among Sudanese petroleum workers with a broad range of benzene exposure. Scholar Journal of Applied Medical sciences, 2015,3(8D),3054-3056. Agab Eldour AA, Khalafalla TO, Babikir AM,Shoaib OM,Hamed IH. Frequency of Rh D, C, c, E, e, and Kell antigens smong Sudanese patientswith sickle cell disease. A syudy from Khartoum, Sudan. Scholar Journal of Applied Medical Sciences, 2016, 4(1A): 1-5. Agab Eldour AA, Mohmed IM, Salih RA, Aljoda AA, Ahmed HG. Assessment of oral epithelium cytomorphological changes among pipe water smokers. European Accademic Research, Vol. III, Issue 11, Feb 2015. Agab Eldour AA, Khalafalla TO, Noja HM, Saad TSM, Els\yed M, Babikir AMA. Fibrinogenlevels in hypertensives and nonhypertensives: A cross-sectional study from El Obied, Sudan. Journal of Bioscience and Medicine, 2016,4, 28-32. Beely MABI, Gadelkarim HA, Abd El Aziz MS, Agab Eldour AA, Almutaq AA. B Molecular Detection of Epstein Barr Virus (EBV)Among Sudanese Patients with Esophageal Cancer. Gadelkarim HA, Beely MABI, Abd El Aziz MS, Agab Eldour AA, Alshammari FD. Prevalence of high Risk Human Papilloma Viruses 16 & 18 (HR-HPV16&18) Among Sudanese Patients with Esophageal Cancer. Agab Eldour AA, Abdel Gadir RZ. Reliability of Sickling test using sodium metabisulphite in diagnosing sickle cell disease. Agab Eldour AA, El Fatih M. Coagulation disorders in patients with pulmonary tuberculosis attending El Obied and Abu Anga Teaching hospitals. Agab Eldour AA, Mohmed NE, Ahmed GK. Cytological study of common causative agents of vaginal discharge among patients attending antenatal care clinic, El Obied Teaching Hospitals. Agab Eldour AA, Awad Elseed. Negative appendicectomy in El Obied Teaching Hospital. Agab Eldour AA, Mohmed IN. Histopathological identification of commom cauases of lymphadenopathy in Sudan. Fagere MO, Mohmrd AA, Agab Eldour AA. Utilization of CA15-3, CEA, EMB and NSE in the diagnosis of malifnant serous effusions in Sudan. Mohmed AA,Agab EldourAA, Fagere MO. Sensitivity and specificity of selected tumour markers I differentiating between benign and malignant effusions in Sudan.